Whilst the filter is small it delivers a big flow which allows it to be installed directly on the main cold water feed to the kitchen tap. This eliminates the need for a separate tap on the side of the sink. This is the next Generation of Reverse Osmosis system as it has been designed and engineered with plumbers and home owners in mind. The system can be easily installed by a plumber or DIY Enthusiast. The cartridges can be replaced easily by the home owner so there is no need for service contracts. 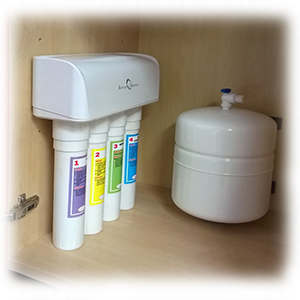 This water softener was designed for houses and apartment which are on a mains water supply. The unit is small in dimension so fits under the kitchen sink and can treat an incoming flow rate of up to 30 lpm.